Earlier this month, it was announced an Amazon Echo might be a key witness in a murder trial. This is not the first time a tech company—or even Amazon—has been pulled into a criminal investigation, which has ignited a heated debate about the privacy of individuals in the face of security risks. As technological advances outpace the policies needed to regulate them, UC San Diego’s School of Global Policy and Strategy, in partnership with the Arthur C. Clarke Center for Human Imagination, has launched an innovative new program arming students with the tools of science fiction in order to anticipate and highlight future policy issues. Author and alumnus Vernor Vinge. 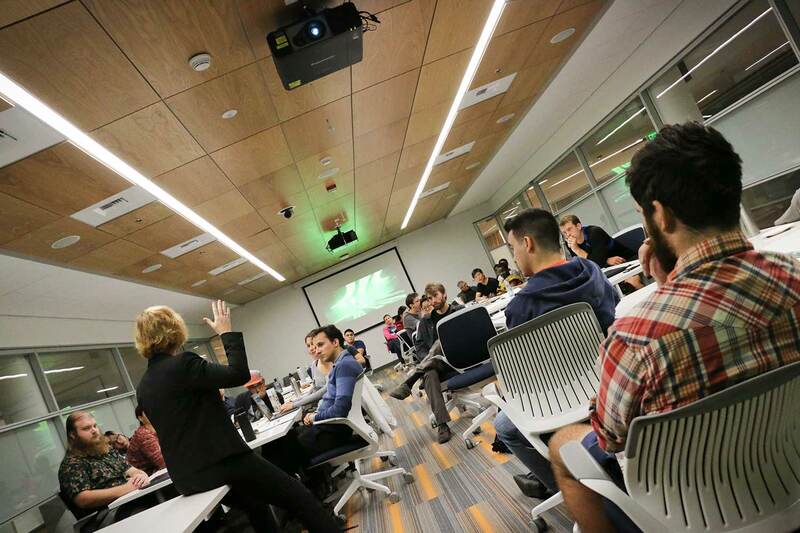 The program, San Diego 2049, challenges UC San Diego’s graduate students to think outside the box and imagine a world unlike the one they are living in today. In small, interdisciplinary teams, they are tasked with looking to the San Diego border region in the year 2049 and how change may impact life here in a number of ways. These issues range from climate change; to the emergence of new artificial intelligences; the redrawing, or complete removal of national boundaries; low-cost gene editing and more. This yearlong program contains public talks and academic panels, a certificate in “Speculative Design for Policymaking” for students, and wraps up with a competition. Over the course of the program, students, faculty, policymakers, the public and industry experts, as well as notable science fiction writers, such as such as Annalee Newitz and Tananrive Due as well as alumni Kim Stanley Robinson and Vernor Vinge, will all share ideas and knowledge as they imagine the area’s sandy shores in 2049. 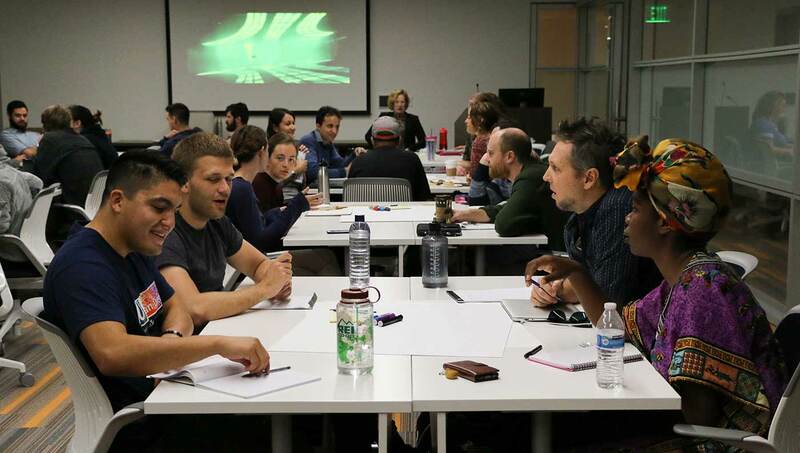 In order to earn the certificate, students form teams to design a vision for the San Diego region within the next three decades and create an intervention into that future. Throughout the program, students are taught sophisticated futurist methods to develop robust scenarios, clarify problems and develop solutions in a rapidly changing, emergent near-future. Essentially, they are worldbuilding: constructing and contextualizing an imaginary, future world. Throughout the program, students are taught sophisticated futurist methods to develop robust scenarios, clarify problems and develop solutions in a rapidly changing, emergent near-future. Worldbuilding is a critical component to many popular science fiction films, such as “Minority Report,” “2001: A Space Odyssey” and most recently “Blade Runner 2049.” These productions were made possible by teams of futurists and experts from across disciplines who were charged with creating fictional future worlds detailed in their execution, presenting a provocative and persuasive point of view based on real-world constraints. Increasingly, worldbuilding methods are used by corporations, government agencies, nonprofits and activists to imagine alternate paths for the future, and then identify from among these possibilities the most desirable outcomes. To prepare students for worldbuilding, each quarter the program brings in prominent guest speakers to meet with students. 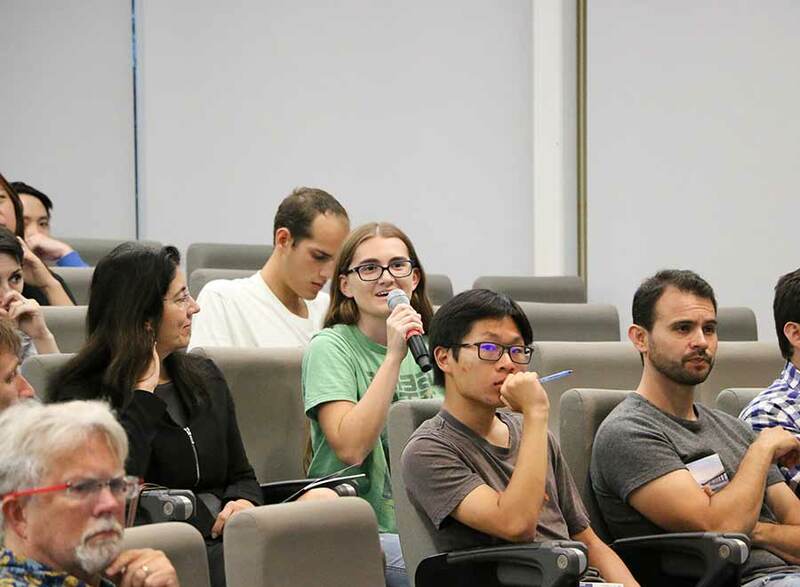 Participants also attend faculty panel discussions on topics expected to be of critical importance to the region in the coming decades, such as the future of labor, work and industry, robotics, bioengineering and synthetic life. For the policy implication component of the program, each student team is paired with a GPS faculty mentor for guidance. The interdisciplinary program is open to students across divisions and was launched this fall as part of the School of Global Policy and Strategy’s 30th anniversary. According to Patrick Coleman, assistant director of the Clarke Center, which is housed within the Division of Physical Sciences, the science fiction genre and speculative culture more generally benefits society by serving as a tool for us to collectively think about the future. 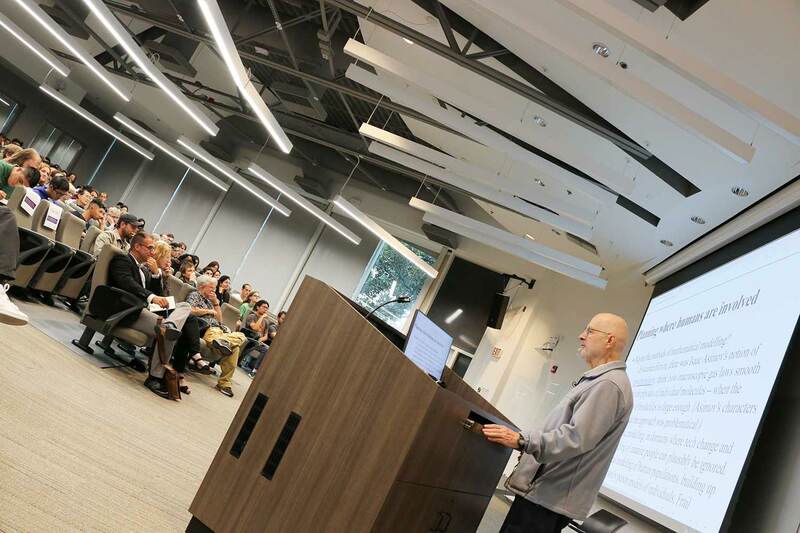 UC San Diego has spawned famous science fiction authors such as Annalee Newitz, Tananrive Due as well as alumni Kim Stanley Robinson and Vernor Vinge. A program like San Diego 2049 is a natural fit for the campus and the surrounding area. The San Diego region is featured prominently in contemporary science fiction, most recently in “Blade Runner 2049.” The city is also home to San Diego Comic-Con. UC San Diego is especially visible with the Clarke Center and its Clarion Science Fiction and Fantasy Writers’ Workshop, as well as the campus’s futuristic-looking Geisel Library. In addition, the campus has spawned famous science fiction authors such as Robinson, Vinge, David Brin, Catherynne Valente and others. Many of these alumni writers are collaborators in the program. Each quarter, students have one recommended sci-fi book to read and are invited to a public talk from the author of that book. 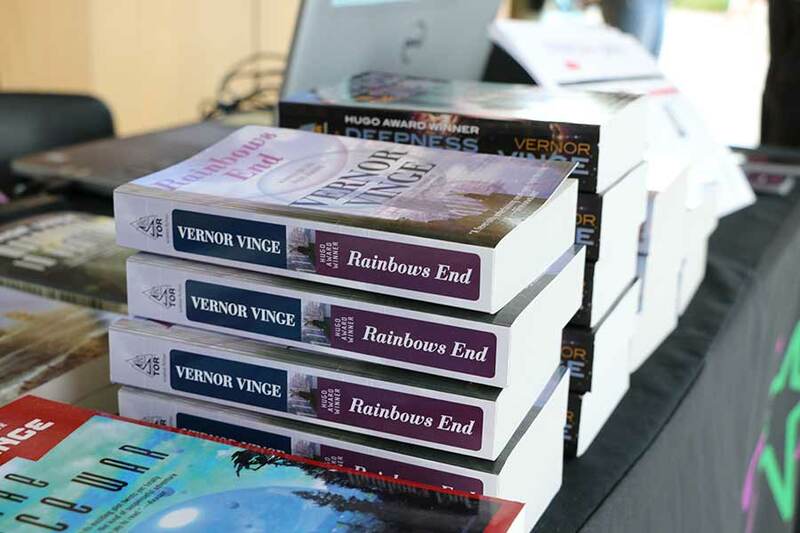 The first was Vinge, whose “Rainbows End” was the reading for fall and who spoke on campus Oct. 12. “Rainbows End” takes place, in large part, on a near-future version of the UC San Diego campus. In addition, Robinson is serving as a judge in the competition, which will culminate in the spring when final projects are due. The excitement around the program has been brewing among participating students and all three public events over fall quarter sold out. Coleman credits the success of the program to many factors including the popularity of the sci-fi genre. Students like Joseph Owuondo, who is earning a masters in public policy degree at the School of Global Policy and Strategy has signed up to do innovative work around cybersecurity. Owuondo’s project is in its infancy stages but he knows he wants to identify, reduce and mitigate vulnerabilities of San Diego’s critical infrastructures and key resources such as power grids, water systems, transportation systems, emergency services, communication, etc. He sees the need for a proactive cybersecurity public-private partnership in these sectors. He believes such partnership is vital in connecting policy, technology and academia. One of the strengths of the programs is that it is truly interdisciplinary with students across division working together. In addition to the School of Global Policy and Strategy, graduate students from the Jacobs School of Engineering, Scripps Institution of Oceanography, School of Medicine, and departments of Visual Arts, Communications, Ethnic Studies, Music and more are participating in the program. One of the strengths of the programs is that it is truly interdisciplinary, according to Coleman. The final projects due in spring can take whichever medium the team deems best to convey its intervention into the future. Some teams may choose to write a policy paper about this prospective world; others may want to create a film following a character or create a podcast of a news program set in the year 2049. Teams will compete for highly coveted prizes, which will be announced in winter quarter. The next public San Diego 2049 event will take place in January, in which the program will host a talk by alumna Rose Eveleth, host of the podcast “Flash Forward,” which tackles a possible (or not so possible) future scenario each week. For more information about San Diego 2049, go to the Flash Forward website.